Was just looking at this in amazon in light of the sad news of Bob Hoskins. Member:9 years, 1 month.......I think i know how hotukdeals works. so you posted this knowing it could possibly freeze? Heat added. Worth the heat for the actor alone. Have some heat just for fact I love this movie and Bob Hoskins :). Blu-rays that have been out a while are not really bargains at this price. will vote hot for bob hoskins. Still a hot deal for the price of an excellent movie on bluray. Despite what anyone says about the actor. Good price for a great movie. The blu-ray has some nice extras too. 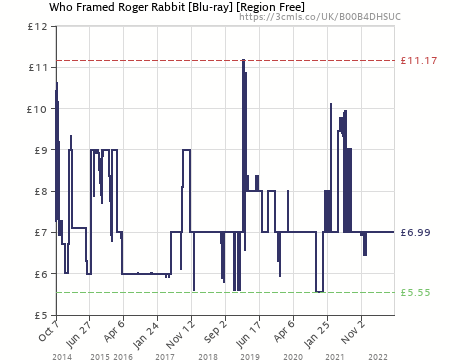 Blu-rays that have been out a while are not really bargains at this … Blu-rays that have been out a while are not really bargains at this price. will vote hot for bob hoskins. This hasn't actually been out that long - it only came out a year ago. Humble n pie spring to mind. Three options here to have it delivered for an extra 45p, In my opinion making it a better deal given the fact your hands won't be tied to a minimum £10 spend. And actually it was a little cheaper before Bob Hoskins died! It always bothered me that the title of this movie does not have a question mark. Discuss. It always bothered me that the title of this movie does not have a … It always bothered me that the title of this movie does not have a question mark. Discuss. 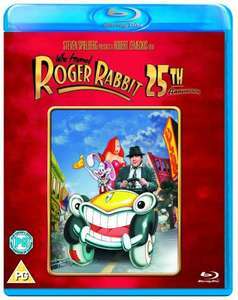 The implication, of course, is that Doctor Who framed Roger Rabbit - and it's a statement, not a question. Love this film, got it as part of 3 for £18 a while ago. The implication, of course, is that Doctor Who framed Roger Rabbit - and … The implication, of course, is that Doctor Who framed Roger Rabbit - and it's a statement, not a question. Yes, I didn't really think it was Doctor Who. Why don't you post a BT phone deal? Might get some heat. Great price, great film, great actor. There are always ghouls waiting to take advantage of other peoples misfortune. This one got his pound of flesh sadly. I think all this heat seeking talk is nonsense. It's a great deal for a quality movie, with a great performance from Bob Hoskins, RIP. If I hadn't seen this deal I would have missed out on adding a great movie to my collection. I haven't seen it in years and am looking forward to watching it again. There are always ghouls waiting to take advantage of other peoples … There are always ghouls waiting to take advantage of other peoples misfortune. This one got his pound of flesh sadly. If this had been some mediocre actor with a couple of poor films but died in a high speed plane/train/car accident then perhaps posting a deal for one of their films MAY have been a tad pathetic, but this is for a great british actor who died from pneumonia and made many many great films, so to get a film of his that was both a great film and had him in it is a good deal and post. This is quite an ironic film to come up as being on here as the main star Bob Hoskley has been reported in the news of having had died recently. For those who don't have seen him in other films he was always in films with Michael Caine. Not sure what this says about us as consumers, but believe it or not films with more punctuation make far less money. Hence no question mark. he was always in films with Michael Caine. No wonder people are saying he was a good actor then. what have you mean here?